Although last night’s loss required extra innings, it was still just a three-hour tour. Which feels fitting given Kyle Hendricks’ most-welcomed performance as “The Professor.” It’s a Gilligan’s Island reference, you stupid millennials. Read a book. For just the second time this season, Hendricks completed eight innings, and for the first time since his 2016 Cy Young campaign, he recorded an out in the 9th. Indeed, with an 8.1 IP, 5H, 0ER, 1BB, 8K performance, last night’s effort was Hendricks’ longest and best start of the season. I said that performance came at just the right time, and I meant it. In the six starts prior to last night’s game, Hendricks had earned a 6.75 ERA with a 5.71 FIP, and generally looking off. Although he was still getting plenty of weak contact and limiting the hard stuff, he had struck out just 20 batters in 29.1 IP, while walking a ridiculous 16. Something just wasn’t working for him. But last night, that 15.3 K%, 12.2% walk rate, and 42.9% ground ball rate from the previous stretch pulled a reverse-Cinderella and turned back into the more familiar 25.8 K%, 3.2 BB%, and 57.1 ground ball rate we’ve come to know and love from Hendricks. Okay, maybe he isn’t always that good, but that’s usually a lot closer to the guy we expect. As for working for all the right reasons, well, we covered one part of that already: the walks. Hendricks has succeeded all these years on a lot more than just command, but the skill does play a disproportionally big role in the likelihood of his success. 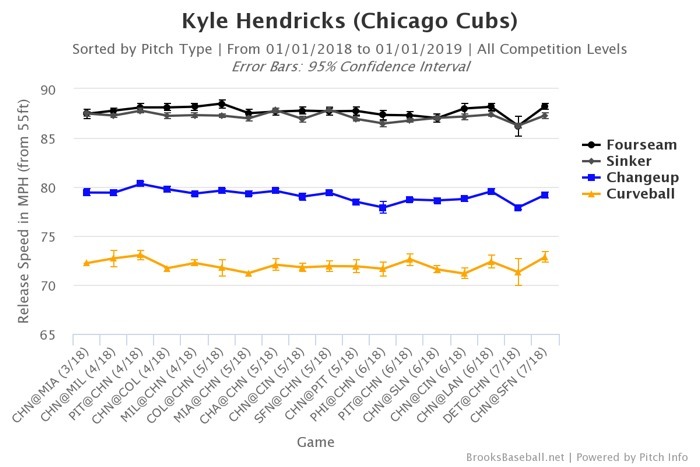 With a lack of premium velocity, Hendricks must execute on the margins, and he had failed to do that time and time again this season. For example: Although we’re only a little over half-way through 2018, Hendricks has already allowed three or more walks five times this season – he did it only six times in all of 2017 and only four times in 2016 (and one of those was a complete game shutout, so …). But last night was an entirely different animal. Just check out his individual ballrates this season by pitch, with last night’s rate next to it. Hendricks’ four-seamer was more or less in line with season-averages, but his sinker, change-up, and curve all found the zone or got a whiff at MUCH higher rates than he’s been used to this season. Speaking of those whiffs, Hendricks recorded 16 swings and misses last night(! ), with a massive 13 of them coming off his change-up. That is devastating. And although most of the credit for those change-up whiffs can be directed towards that pitch’s individual filthiness, Hendricks’ fastball and sinker deserve some respect, too. Moreover, as you know, when he’s commanding the fastball well, Hendricks gets more whiffs on the change-up because of how well those two pitches tunnel together. The batter can’t tell what he’s facing until it’s too late. As for also getting six strikes out of ten curves, well, what can you say. That’s just a good pitcher picking apart an opposing offense. Hendricks had it all working last night and it showed in the results. And while it may not have ended in a win for the Cubs, I stand by what I said in the late-night EBS: the broader “Kyle Hendricks” victory here is probably more important. Before last night, Hendricks had been openly struggling with his delivery and mechanics. And while he sure seems like a psychologically strong dude, that sort of prolonged struggle can impact your confidence. But then last night happened. I think it could make a difference going forward. We’ll see if that last part from Joe Maddon is true, but oh-boy could the Cubs use this version of Kyle Hendricks down the stretch. Because when he pitches up to his abilities, he’s as good at getting results as any starter out there. The same goes for Jose Quintana, who starts later tonight. So let’s see if he can follow suit. Previous PostPrevious post:Cubs Reportedly Looking at Veteran Outfielders like Adam Jones and Curtis Granderson, Eh? Next Post Next post:Yu Darvish Played Catch as He Recovers from His Elbow Impingement – Any Timeline Updates?